Rope Length: 180 cm / 71"
Extra Large Size- ZENY 40" diameter swing seat, 71" long from base to connection point, which fits for three children or two adults about 600 lb weight capacity allows multiple people to swing and play at the same time! Comfortable and Safety - Holds up to 600 lbs for safe riding experience. Provides superior strength while keeping swing in place. Highest quality and adheres to strict safety requirements with quality engineering including a padded steel frame and super strong 71''nylon webbing, the diameter of this Round Web Tree Swing is 40'' , which is large enough for multiple children to swing and play together. Rope seat cushion provides super comfy ride, kids will enjoy comfortably. 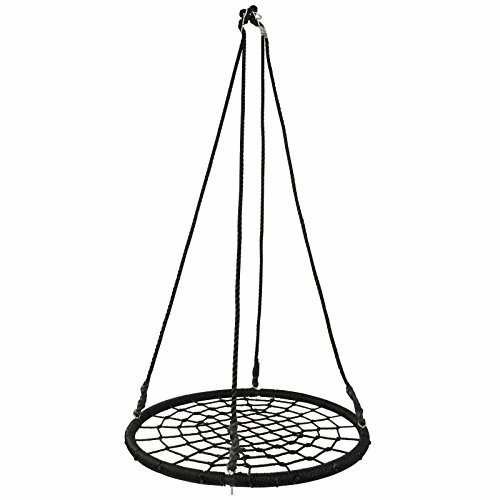 Easy to Install - This ZENY web tree swing is designed for secure installation, top of ropes have steel rings which connect to sturdy suspension rope up to approx. 71" long from base to connection point. Hangs almost anywhere from a sturdy tree branch to swing set, can be re-located or taken down for easy storage. Hang within minutes! Quick and easy assembly saves time and hassle! Durable for Long time Use - Heavy-duty spider web design features tough rope net seat with thick woven nylon material ensures this tree swing will last you and your kids for years. View More In Play & Swing Sets.